The Environmental Protection Agency made a huge step forward on Tuesday with the announcement of rules limiting greenhouse gas emissions from new power plants—the first rules for power plants, ever. The rules are the beginning of the end of conventional coal-fired power plants, and have been cheered by environmental and public health groups. The agency is proposing that new fossil-fuel power plants—namely those fired by coal and natural gas—emit no more than 1,000 pounds of carbon per megawatt-hour of energy produced. That’s about the same amount of carbon emissions produced by today’s natural gas-plants and about half the amount of produced by coal plants. This basically means that going forward, anyone proposing new power plants has two options: build a natural-gas powered plant, or build a coal plant that has carbon-capture-and-sequestration (CCS) technology to significantly reduce the emissions from that plant. The rules make it likely that there won’t be any new coal plants built in the US—or at least not anytime soon. While there are currently demonstration plants in the works that feature CCS technology, they aren’t to the scale of a new full-sized plant, nor are they cost effective. What’s more, plants powered by natural gas, which is pretty cheap at the moment, can meet the new, lower-emission requirements pretty easily. 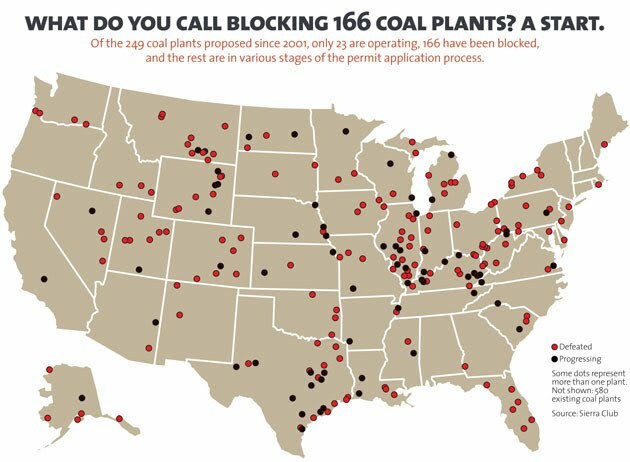 But here’s why environmentalists aren’t celebrating quite as much as you’d think they would: The rule doesn’t apply to power plants that have already received permits to begin construction. Nor does it apply to plants that are already in operation—meaning that the approximately 300 older, dirtier coal plants that currently provide 39 percent of our energy will still be allowed to release CO2 unfettered. “We have no plans to address existing plants,” said EPA administrator Lisa Jackson. She noted that “in the future if we were to,” that would require an additional and thorough rule-making process. As the chart to the left shows, cutting emissions by only stopping new coal plants isn’t as effective at reducing US emissions as an economy-wide cap-and-trade law passed by Congress would have been, because in this scenario old plants are still emitting with abandon. But stopping plants—either by EPA action like today’s or by blocking them from being built—does eliminate a chunk of potential future emissions. Correction: An earlier version of this article incorrectly stated that the 15 plants would be impacted by the new rule, when in fact they will not. The sentence has been corrected.